Starting on July 1, 2016 Chipotle will start their new Summer Loyalty Program (July through September). 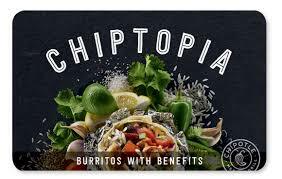 All you have to do is pick up a Chiptopia Card at any Chipotle Restaurant and after four qualifying visits you will start to earn free food items. You will also get Free Chips and Guac with your first purchase. If you love going to Chipotle this loyalty program is for you!